11 May 1981; 37 years ago (1981-05-11): New London Theatre, London, England, U.K. Directed by Trevor Nunn and choreographed by Gillian Lynne, Cats first opened in the West End in 1981 and then with the same creative team on Broadway in 1982. It won numerous awards, including Best Musical at both the Laurence Olivier Awards and the Tony Awards. By 1994, the musical had grossed over $2 billion worldwide. The London production ran for 21 years and the Broadway production ran for 18 years, both setting new records. Actresses Elaine Paige and Betty Buckley became particularly associated with the musical. The most well-known song from Cats, "Memory", has been recorded by more than 150 recording artists. Cats was the longest-running Broadway show in history from 1997 until 2006 when it was surpassed by The Phantom of the Opera. As of 2018, it is the fourth-longest-running Broadway show and the sixth-longest-running West End show. Cats has been performed around the world many times and has been translated into 15 languages. The Japanese production by the Shiki Theatre Company has performed over 10,000 shows since it first opened in 1983. The musical was adapted into a direct-to-video film in 1998, with a 2019 film adaptation by Tom Hooper set to follow. Cats is based on T. S. Eliot's 1939 poetry book Old Possum's Book of Practical Cats, which composer Andrew Lloyd Webber recalled as having been a childhood favorite. The songs of the musical comprise Eliot's verse set to music by Lloyd Webber, the principal exception being the most famous song from the musical, "Memory", for which the lyrics were written by Trevor Nunn based on an Eliot poem entitled "Rhapsody on a Windy Night". Additionally, a brief song entitled "The Moments of Happiness" was taken from a passage in Eliot's Four Quartets. Lloyd Webber began composing the songs in late 1977 and premiered the compositions at the Sydmonton Festival in 1980. The concert was attended by T .S. Eliot's widow, Valerie Eliot, who then gave her permission for the songs to be adapted into a musical stage play. Rehearsals for the musical began in early 1981 at the New London Theatre. Due to the Eliot estate asserting that they write no script and only use the original poems as the text, the musical had no identified plot during the rehearsal process, causing many actors to be confused about what they were actually doing. Cats is an unusual musical in terms of its construction; along with Eliot's poems, music and dance are the key elements of the show, at the expense of a traditional narrative structure. The plot centres on a tribe of cats called the Jellicles, on the night of the Jellicle Ball where they decide which one of them will ascend to the Heaviside Layer (used here as a metaphor for heaven). The bulk of the musical comprises the different contenders being introduced, either by themselves or by other cats. The show is completely told through music with no dialogue in between the songs, although there are occasions when the music accompanies spoken verse. Lloyd Webber's compositions are eclectic; musical styles range from operetta and hymn, to pop, rock, jazz and music hall. Many of the songs are pastiches of their respective genres, such as the spy film soundtrack-esque "Macavity: The Mystery Cat". Cats is a dance-heavy musical and includes a 10-minute dance sequence during the "Jellicle Ball". Choreographed by Gillian Lynne, the dance styles are varied and incorporate ballet, music hall, folk, jazz and tap, interspersed with acrobatic displays. Lynne based her choreography on the movement of actual cats, and each character moves in a distinctive feline manner that is tailored to their individual personality. The set, designed by John Napier, consists of a junkyard filled with over 2,000 oversized props to give the illusion of being seen from a cat's perspective. The set remains the same throughout the show without any scene changes. The Jellicle cats gather every year to make the "Jellicle Choice", and decide which cat will ascend to the Heaviside Layer and come back to a new life. After the overture, the cats gather on stage and explain the Jellicle tribe and its purpose ("Jellicle Songs for Jellicle Cats"). The cats (who break the fourth wall throughout the show) then notice that they are being watched by a human audience, and proceed to explain how the different cats of the tribe are named ("The Naming of Cats"). This is followed by a ballet dance performed by Victoria the White Cat to signal the beginning of the Jellicle Ball ("The Invitation to the Jellicle Ball"). At this moment, Munkustrap, the show's main narrator, explains that tonight the Jellicle patriarch Old Deuteronomy will make an appearance and choose one of the cats to be reborn into a new life on the Heaviside Layer. The first contender Munkustrap introduces is Jennyanydots ("The Old Gumbie Cat"), a large tabby cat who lazes around all day, but come nighttime, she becomes active, teaching mice and cockroaches various activities to curb their naturally destructive habits. Just as Jennyanydots finishes her song, the music changes suddenly, hence Munkustrap's annoying younger brother, Rum Tum Tugger, makes his extravagant entrance in front of the tribe ("The Rum Tum Tugger"). He is very fickle and unappeasable, "for he will do as he do do, and there's no doing anything about it". Then, as Rum Tum Tugger's song fades, a shabby old grey cat stumbles out wanting to be reconciled; it is Grizabella. All the cats back away from her in fear and disgust and explain her unfortunate state ("Grizabella: The Glamour Cat"). Grizabella leaves and the music changes to a cheerful upbeat number as Bustopher Jones, a fat cat in "a coat of fastidious black", is brought to the stage ("Bustopher Jones: The Cat About Town"). Bustopher Jones is among the elite of the cats, and visits prestigious gentlemen's clubs. Suddenly, a loud crash startles the tribe and the cats run offstage in fright. Hushed giggling sounds signal the entrance of Mungojerrie and Rumpleteazer, a pair of near-identical cats. They are petty burglars, very mischievous, and they enjoy causing trouble around their human neighbourhood ("Mungojerrie and Rumpleteazer"). After they finish, they are caught off-guard and confronted by the rest of the cats. Finally, the Jellicle patriarch, Old Deuteronomy, arrives before the tribe ("Old Deuteronomy"). He is a large old cat that "has lived many lives" and "buried nine wives (And more, I am tempted to say—ninety-nine)". He is the cat who chooses which Jellicle will go to the Heaviside Layer every year. The Jellicles put on a play for Old Deuteronomy ("The Awefull Battle of the Pekes and the Pollicles"), telling a story about two dog tribes clashing in the street and subsequently being scared away by the Great Rumpus Cat. After a moral from Old Deuteronomy about the destiny of Jellicle cats and Pollicle dogs, a second loud crash, presumably from Macavity, sends the alarmed cats scurrying. After a quick patrol for Macavity, Old Deuteronomy deems it a false alarm and summons the cats back as the main celebration begins ("The Jellicle Ball"), in which the cats sing and display their "Terpsichorean powers". During the Ball, Grizabella reappears and tries to dance along, but her age and decrepit condition prevent her from doing so ("Memory (Prelude)"). Once again, she is shunned by the other cats while Old Deuteronomy looks on sadly. After addressing the gathering by singing "Memory", Grizabella is chosen to be reborn into a new Jellicle life. After the Jellicle Ball, Old Deuteronomy contemplates "what happiness is", referring to Grizabella. However, the cats do not understand him, so he has Jemima (or Sillabub, depending on the production), the youngest of all Jellicles, sing it in simpler terms ("The Moments of Happiness"). Gus — short for Asparagus — shuffles forward as the next cat to be introduced ("Gus: The Theatre Cat"). He was once a famous actor but is now old and "suffers from palsy which makes his paws shake." He is accompanied by Jellylorum, his caretaker, who tells of his exploits. Gus then remembers how he once played the infamous pirate captain, Growltiger a.k.a. the Terror of the Thames ("Growltiger's Last Stand"). Gus tells the story about the pirate captain's romance with Lady Griddlebone, and how Growltiger was overtaken by the Siamese and forced to walk the plank to his death. Back in the present, after Gus exits, Skimbleshanks is seen sleeping in the corner ("Skimbleshanks: The Railway Cat"). He is the cat who is unofficially in charge of the night train to Glasgow. Skimbleshanks is considered vital to the rail operations, as without him "the train can't start". Within his song, a whole steam train engine is assembled out of objects in the junkyard. With a third crash and an evil laugh, the "most wanted" cat Macavity appears. He is the so-called "Napoleon of Crime" who always manages to evade the authorities. Macavity's henchmen capture Old Deuteronomy and take off with the patriarch in tow. As Munkustrap and his troops give chase, Demeter and Bombalurina explain what they know about Macavity ("Macavity: The Mystery Cat"). When they are finished, Macavity returns disguised as Old Deuteronomy, but his cover is blown by Demeter and he ends up in a fight with Munkustrap and Alonzo. Macavity holds his own for a time, but as the rest of the tribe begin to gang up and surround him, he shorts out the stage lights and escapes in the resulting confusion. After the fight, Rum Tum Tugger suggests that the cats should find a local magician named Mr. Mistoffelees for help ("Magical Mr. Mistoffelees"). Known as the "original conjuring cat", Mr. Mistoffelees can perform feats of magic that no other cat can do. He displays his magical powers in a dance solo and uses them to restore the lights and bring back Old Deuteronomy. Now, the Jellicle Choice can be made. Before Old Deuteronomy can announce his decision, Grizabella returns to the junkyard and he allows her to address the gathering. Her faded appearance and lonely disposition have little effect on her song ("Memory"). With acceptance and encouragement from Jemima and Victoria, her appeal succeeds and she is chosen to be the one to go to the Heaviside Layer and be reborn to a new Jellicle life ("Journey to the Heaviside Layer"). A large tyre rises from the piles of junk, carrying Grizabella and Old Deuteronomy partway toward the sky; he then steps off so she can finish the journey on her own. Finally, Old Deuteronomy gives his closing speech to the audience ("The Ad-dressing of Cats") and the show comes to a close. ‡Song has been dropped from the US and UK productions of the show since 2016. In the 2016 Broadway revival, the number was replaced by "The Awefull Battle of the Pekes and the Pollicles". Based on the definitive 16-piece licensed version. From left to right: Old Deuteronomy, Jemima, Grizabella and Victoria in the German tent tour of Cats, 2011. Asparagus a.k.a. Gus: The Theatre Cat – An elderly cat whose paws tremble from old age; he spends his time reminiscing about his past exploits when he used to be a famous theatre actor. Bombalurina – A flirty and confident red queen; she is best friends with Demeter and the two share an intense hatred for Macavity. Bustopher Jones – A fat upper-class cat who is respected by all. He is described as "the Brummell of cats" due to his immaculate pelt, which resembles a tuxedo and spats. In most productions, the actor playing Gus also plays Bustopher, though in early productions the part was handled by the actor playing Old Deuteronomy. Demeter – A troubled and skittish queen; she is best friends with Bombalurina and the two share an intense hatred for Macavity. Griddlebone – Growltiger's lover in "Growltiger's Last Stand", in which she sings "The Ballad of Billy M'Caw" or the mock Italian aria "In Una Tepida Notte" (depending on production). Usually played by the actor playing Jellylorum. Grizabella – A former "glamour cat", ostracised by the Jellicles, who has lost her sparkle and now only wants to be accepted. Growltiger – A theatrical character Gus recalls playing in his youth, and who appears in Gus' memory during "Growltiger's Last Stand". In some productions he is portrayed as a vicious pirate; in others, he is more comical. Usually played by the actor playing Gus. Jellylorum – A queen who watches out for the kittens and takes care of Gus. Named after T. S. Eliot's own cat. Jemima/Sillabub – The youngest kitten. She is described as sweet and compassionate, and becomes the first cat to accept Grizabella when she sings alongside her in "Memory (reprise)". Jennyanydots a.k.a. the Old Gumbie Cat – She sits around all day and is seemingly very lazy, but at night, she becomes very active as she rules the mice and cockroaches, forcing them to undertake helpful functions and creative projects to curb their naturally destructive habits. Macavity – A notorious criminal known as The Napoleon of Crime. The character is a literary allusion to the Sherlock Holmes character Professor Moriarty. Mr. Mistoffelees – A young black and white tuxedo tom learning to control his magical powers. He is a featured dancer, performing twenty-four consecutive fouettés en tournant during his number. Mistoffelees' chorus identity is sometimes known as Quaxo. Mungojerrie – A mischievous troublemaker, he is one-half of a notorious duo of cat-burglars along with Rumpleteazer. Munkustrap – A grey tabby tomcat who is the storyteller and protector of the Jellicle tribe. He is Old Deuteronomy's second-in-command and the show's main narrator. Old Deuteronomy – The wise and beloved elderly Jellicle leader; he tries to get the tribe to accept Grizabella all through the show. Rumpleteazer – A mischievous troublemaker, she is one half of a notorious duo of cat-burglars along with Mungojerrie. Rum Tum Tugger – A flashy and unappeasable cat who loves to be the centre of attention. His temperament ranges from clownish to serious. Skimbleshanks a.k.a. the Railway Cat – An upbeat and active orange tabby cat, who lives on the mail trains and acts as an unofficial chaperone to such an extent he is considered rather indispensable to the train and station employees. Victoria the White Cat – A naive and shy white kitten who is known for her beauty and poise. She is a featured dancer, opening with a dance solo after "The Naming of the Cats" and is the first character to touch Grizabella. Etcetera (front) and Alonzo in the Polish production, December 2007. Admetus/Plato – The chorus identity of Macavity. Typically paired with Victoria in a pas de deux during the Jellicle Ball. Alonzo – A black-and-white/black-and-gold tom. Sometimes considered the third in seniority after Munkustrap as he also fights Macavity. Bill Bailey/Tumblebrutus – A brown-and-white tom kitten. He is a playful young kitten, often performing acrobatics as well as being a strong dancer. His costume is patchy browns on a white base, suggesting he is a Bi-colour tabby and white. Carbucketty/Pouncival – A brown-and-white tom kitten. The name "Carbucketty" was created by T. S. Eliot for a "knockabout cat". Cassandra – A brown pointed queen. Coricopat and Tantomile – Twin brother and sister with psychic abilities. The name "Tantomile" was created by T. S. Eliot for a "Witch's Cat". Electra and Etcetera – Tabby kittens who are fans of Rum Tum Tugger. Etcetera was the chorus identity of Rumpleteazer early in the Broadway production and has since evolved into a separate character. Rumpus Cat – A spiky-haired cat with glowing red eyes, seen as a sort of superhero figure and the star of The Awefull Battle of the Pekes and the Pollicles. Usually played by Alonzo, Admetus or George. Notable replacements have been featured throughout the musical's West End and Broadway runs. Cats has been translated into over 15 languages and produced professionally in more than 30 countries. 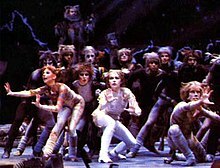 Cats premiered in the West End at the New London Theatre on 11 May 1981. There was trouble initially as Judi Dench, cast in the roles of Grizabella and Jennyanydots, snapped her Achilles tendon during rehearsals prior to the London opening. Dench had to pull out and Elaine Paige took over the role of Grizabella. The musical was produced by Cameron Mackintosh and Andrew Lloyd Webber's Really Useful Group, directed by Trevor Nunn, with associate director and choreographer Gillian Lynne, design by John Napier, and lighting by David Hersey. The conductor was Harry Rabinowitz. It played a total of 8,949 performances in London. Its final performance in London's West End was on its 21st birthday, 11 May 2002, and broadcast on a large screen in Covent Garden for fans who could not acquire a ticket for the final performance. It held the record as London's longest-running musical until 8 October 2006, when it was surpassed by Les Misérables. The musical returned to the West End 12 years later for a limited run. A 12-week run at the London Palladium was first announced in mid-2014. Beginning in December 2014, the revival starred Nicole Scherzinger as Grizabella, and featured the original creative team, with direction from Nunn, choreography by Lynne and design by Napier. Lloyd Webber was also involved and rewrote a number of songs for the revival. The run was later extended through April 2015, with Kerry Ellis replacing Scherzinger as Grizabella; 100,000 tickets were released for the extended run. The musical returned once again to the London Palladium for a limited run lasting from 23 October 2015 to 2 January 2016, starring Beverley Knight as Grizabella. The show made its debut on Broadway on 7 October 1982, at the Winter Garden Theater with the original London production team. Pre-sale tickets totaled $6.2 million before the show opened, the largest in Broadway history at the time. Parts of the Winter Garden were knocked down to make room for the junkyard set, while a part of the roof was torn to allow for the effects of show's finale in which Grizabella ascends to the Heaviside Layer. The Broadway show cost over $5 million to produce, four times that of the original London production, making it the most expensive Broadway show in history at the time. On 19 June 1997, Cats became the longest-running musical in Broadway history with 6,138 performances. At the time, the show was found to have had an economic impact of $3.12 billion on New York City, and had generated the most theatrical jobs of any single entity in Broadway history. It closed on 10 September 2000, after a total of 7,485 performances. One actress, Marlene Danielle, performed in the Broadway production for its entire run (from 1982 until 2000). The show's Broadway-run record was surpassed on 9 January 2006 by The Phantom of the Opera, and Cats remains Broadway's fourth-longest-running show in history. Overall, the original Broadway production grossed approximately $388 million (not adjusted for inflation). A Broadway revival opened on 31 July 2016 at the Neil Simon Theatre. The revival featured new choreography by Andy Blankenbuehler, with Nunn and Napier from the original creative team returning to direct and design respectively. Scherzinger, who played Grizabella in the 2014 West End revival, had originally agreed to reprise the role on Broadway but later withdrew. Leona Lewis was cast to replace her and was ultimately succeeded by Mamie Parris in October 2016. The Broadway revival closed on 30 December 2017 after 16 previews and 593 performances. Following its Broadway debut, Cats has been staged extensively across North America. The musical's first US national tour launched at the Shubert Theatre in Boston in December 1983, with Laurie Beechman playing Grizabella and Charlotte d'Amboise playing Cassandra. The production left Boston in May 1984 and had residencies across eight more states before returning to Boston where it closed in November 1987. A Los Angeles production at the Shubert Theatre ran from January 1985 to November 1986, starring Kim Criswell in the role of Grizabella. Meanwhile, the first Canadian production opened in 1985 at the Elgin and Winter Garden Theatres and toured for around five years. This was followed by a North American touring production that ran from September 1986 to September 1988, and another that ran from March 1987 to December 1999 (with Bryan Batt as Munkustrap in the 1991–1992 cast, David Hibbard as Rum Tum Tugger in the 1992–1993 cast, and Lena Hall as Demeter in the 1998 cast). In the 1990s, there were five different productions touring the United States. By 1991, Cats had the longest-running continuous US tour in musical theatre history. After the show's closure on Broadway in 2000, the first non-Equity national production of Cats by Troika Entertainment toured North America from 2001 to 2012 (with Julie Garnyé as Jennyanydots in the 2001 cast, and Dee Roscioli as Grizabella in the 2002 cast). A second Canadian touring production began in 2013, 28 years after the first one launched. In January 2019, a new North American tour based on the 2016 Broadway revival opened at the Providence Performing Arts Center in Rhode Island, and is scheduled to run through June 2020. Cats has also been staged by major regional theatres. An amphitheatre production was staged at The Muny in 2010, and featured Stephanie J. Block as Grizabella and Lara Teeter as Munkustrap. The first UK tour opened with a six-month residency at the Opera House Theatre in Blackpool in 1989, with Marti Webb playing Grizabella. The musical returned to Blackpool in 2015 for a limited run starring Jane McDonald as Grizabella. Another national tour ran in the early 1990s featuring Olympic figure skating champion Robin Cousins as Munkustrap. Following the closure of the original West End production in 2002, a nationwide tour embarked in 2003 with Chrissie Hammond starring as Grizabella, until Dianne Pilkington took over the role in 2006. Hammond reprised the role on tour again from 2007 to 2008. A UK/European tour of Cats launched on 9 February 2013 at the Edinburgh Playhouse with Joanna Ampil as Grizabella, running through 2014 before transferring to the West End. A subsequent UK/European tour began in 2016, this time with Anita Louise Combe as Grizabella and Marcquelle Ward as Rum Tum Tugger, running through 2019. On 24 March 2013, the largest production of Cats was staged by 3,500 students from Stagecoach Theatre Arts schools at the Birmingham National Indoor Arena. Shortly after its West End and Broadway debuts, the first non-English production of Cats premiered in March 1983 at the Madách Theatre in Budapest, Hungary. Since then, the Hungarian-language production has continued to be staged as part of the Madách Theatre's repertoire and, as of 2017, has been performed nearly 1,500 times. The original German-language production at the Theater an der Wien in Vienna, Austria, opened in September 1983 and played 2,040 shows before moving to the Ronacher Theatre in 1988, where it ran until 1990. The original Viennese cast included Ute Lemper, who alternated between the roles of Bombalurina and Grizabella, and Steve Barton who played Munkustrap. Pia Douwes was also a member of the Viennese cast from 1987 to 1989, covering several different characters including Grizabella. Cats is scheduled to return to the Ronacher Theatre in September 2019 under Vereinigte Bühnen Wien. Meanwhile, the musical was first staged in Germany by Stella Entertainment in 1986 at the Operettenhaus in Hamburg, where it ran for 15 years before transferring to Stuttgart in 2001. The production was then taken over by Stage Entertainment and had residencies in Berlin (2002–04) and Düsseldorf (2004–05), before touring until 2006. A separate theatre company of Cats also toured Germany from December 2010 to June 2013, performing in a travelling purpose-built tent theatre. Cats has also had shorter engagements in other European countries. November 1985 saw the premiere of a Norwegian-language production at Det Norske Teatret in Oslo. It played a total of 197 performances and included performers such as Øivind Blunck, Brit Elisabeth Haagensli and Øystein Wiik. In 2009, the Norwegian show returned to Oslo where it was staged at the Chat Noir. Jorma Uotinen directed and choreographed a Finnish production at the Helsinki City Theatre that ran from September 1986 to December 1988, and featured Monica Aspelund as Grizabella and Heikki Kinnunen as Gus. A Swedish version of the musical opened in 1987 in Chinateatern in Stockholm, before transferring to Scandinavium in Gothenburg two years later. It was revived at the Gothenburg opera house from 2006 to 2007. The Carré Theatre in Amsterdam, Netherlands, has staged the musical in 1987 (with Ruth Jacott as Grizabella), 1988, and from 1992 to 1993. A Dutch touring production also ran from 2006 to 2007, with a brief stop in Antwerp. This production by Stage Entertainment featured several performers in the role of Grizabella including Pia Douwes and Anita Meyer. Stage Entertainment has also staged the musical in Madrid (2003–05), Moscow (2005–06; with a cast that included Ivan Ozhogin as Munkustrap) and Paris (2015–16). In Moscow, the musical had been previously performed in 1988 with the Viennese cast including Pia Douwes, while in Paris, it had also previously been performed at the Théâtre de Paris from 1989 to 1990. The show was also produced in Zürich (1991–1993), Antwerp (1996), Copenhagen (2002–2003), Warsaw (2004–2008), and Prague (2005). The first Italian-language production toured Italy in the 2009–2010 season. International productions of Cats have toured the European region extensively, starting with a Eurotour that launched in the mid-1990s. English-language touring companies subsequently made stops across Europe; first in the mid to late 2000s, which included performances in Hungary, Greece, Portugal and Germany, then in 2013–2014 with stops in Ireland, Belgium, Greece, Italy, Monaco, and Portugal. Most recently, an English-language production played in numerous European cities from 2016 to 2019. The 2016 stop in Slovakia featured Katarína Hasprová in the role of Grizabella. Cats has toured Asia on several occasions. The show performed in Asia from 1993 to 1994, playing in Singapore (with local actress Jacintha Abisheganaden as Grizabella), Hong Kong and South Korea. The show came to Asia again in 2002–2004 when it visited Malaysia, South Korea, Shanghai, Taipei and Beijing; the 2004 cast included Slindile Nodangala in the role of Grizabella. A touring company visited Asia between 2007 and 2010, including stops in Taiwan, Macau, and Thailand in 2007; South Korea from 2007 to 2009; China in 2008; Singapore and Hong Kong in 2009 (with Delia Hannah playing Grizabella); and Manila in 2010 (with Lea Salonga as Grizabella). A Chinese-language production toured various cities in China in 2012. Cats toured Asia again from 2014 to 2015, making stops in South Korea, Singapore and Macau. An international tour ran once more from 2017 to 2019, with visits to South Korea, China (with Joanna Ampil as Grizabella), Hong Kong and Taiwan, and planned stops in the Philippines and Singapore. From September 2008 to January 2009, a Korean production performed at the Charlotte Theatre in Seoul, with Shin Youngsook and Ock Joo-hyun alternating as Grizabella, Kim Jin-woo and Daesung alternating as Rum Tum Tugger, and Kim Bo-kyung as Rumpleteazer. This production was revived from 2011 to 2012, with Insooni and Park Hae-mi taking turns to portray Grizabella. The production of Cats by the Shiki Theatre Company has been playing in Japan since 1983. The show premiered in a tent theatre in November 1983 in Shinjuku, Tokyo. 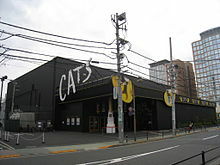 As of 2019[update], the show is performed at the purpose-built CATS Theatre in Tokyo. The production performed its 10,000th show on 12 March 2019. The first Australian production ran from 1985 to 1987 at the Theatre Royal in Sydney (with Debra Byrne as Grizabella, Marina Prior as Jellylorum, Jeff Phillips as Rum Tum Tugger, and Anita Louise Combe as Sillabub), with subsequent residencies at Her Majesty's Theatre in Melbourne in 1987, and at the Adelaide Festival Centre in 1989. This was followed by a national tour from 1993 to 1996, during which Delia Hannah made her debut as Grizabella in 1994. A professional circus adaptation of Cats, titled Cats Run Away to the Circus, had a national tent tour from 1999 to 2001, with Hannah once again starring as Grizabella. Hannah reprised her role for another production that toured Australia and Asia in 2009 and 2010. In July 2014, Australia's Harvest Rain Theatre Company staged the biggest production of Cats in the Southern Hemisphere with over 700 performers. Produced by Tim O'Connor, the production was performed at the Brisbane Convention & Exhibition Centre. Callum Mansfield directed and choreographed it, and its record-breaking cast included Marina Prior as Grizabella and Steven Tandy as Bustopher Jones and Gus. From October 2015 to May 2016, a revival toured Australia with stops in Sydney, Hobart, Melbourne, Brisbane, Adelaide, and Perth. The revival featured singer-songwriter Delta Goodrem as Grizabella, before Delia Hannah took over the role during the Adelaide and Perth seasons. The musical played in Auckland from 1989 to 1990, and a New Zealand production was launched in 2015. Spanish-language productions of Cats have been staged in Central and South America. The musical premiered in Mexico in 1991–1992, where the production performed over 400 shows and starred María del Sol as Grizabella, Manuel Landeta as Munkustrap, Susana Zabaleta as Jellylorum, Maru Dueñas as Sillabub and Ariel López Padilla as Macavity. The show was revived in 2013 with Filippa Giordano, Lila Deneken and Myriam Montemayor Cruz alternating as Grizabella, and again in 2018–2019 with Yuri as Grizabella and Manuel Landeta as Old Deuteronomy. Cats was also produced in Argentina in 1993 (with Olivia Bucio as Grizabella), in Chile in 2006 (at the Arena Santiago) and 2014, in Colombia in 2009, and in Brazil in 2010 (with Paula Lima as Grizabella). Other countries that the musical has been performed in include Qatar (2003, 2017), Turkey (2013), Israel (2014), and South Africa (2001–2002). Royal Caribbean International announced in April 2014 that a fully licensed production of Cats will be performed regularly for guests aboard the cruise ship Oasis of the Seas; the production began playing in autumn 2014. Steven Spielberg's Amblimation had planned an animated adaption of the musical, but the project was abandoned with the studio's closure in 1997. The following year, a direct-to-video film was released. The film was directed by David Mallet and was shot at the Adelphi Theatre in London. It starred Elaine Paige as Grizabella, John Mills as Gus, Ken Page as Old Deuteronomy, and Michael Gruber as Munkustrap. The home video released by Universal Pictures in 2002 is certified 18x Platinum in the UK. In May 2016, a film adaption directed by Tom Hooper for Universal Pictures and Working Title Films was announced. The film will star Jennifer Hudson as Grizabella, Taylor Swift as Bombalurina, James Corden as Bustopher Jones, Judi Dench as Old Deuteronomy, Jason Derulo as Rum Tum Tugger, Idris Elba as Macavity, Ian McKellen as Gus, Rebel Wilson as Jennyanydots and Francesca Hayward as Victoria. Filming began at the end of 2018 and Cats is scheduled to premiere on 20 December 2019. The live production of Cats has undergone several revisions since its London and subsequent Broadway openings. Several songs have had verses cut since the original London cast recording, while some of the original vocal parts have also been re-assigned to other characters. The "Growltiger's Last Stand" sequence has been changed multiple times over the course of the show's history. In the original London production, the "last duet" for Growltiger and Griddlebone was a setting of an unpublished T. S. Eliot poem, "The Ballad of Billy M'Caw". For the original Broadway production, the Ballad was replaced with "In Una Tepida Notte", a pastiche of Italian opera (reminiscent of Puccini's La fanciulla del West). This new version was subsequently incorporated into most productions of Cats worldwide, and eventually the London production. In later productions, a lyric in "Growltiger's Last Stand" was changed to replace the racially insensitive "Chinks" with "Siamese". By 2008, "The Ballad of Billy M'Caw" had been re-instated in the UK tour productions, but was once again replaced by the Italian aria for the 2014 UK tour and London productions. In the 1998 video version, the entire scene featuring Growltiger was cut due to John Mills' (Gus) old age. By 2016, "Growltiger's Last Stand" had been removed completely from the US and UK productions of the show. In the 2016 Broadway revival, the number was replaced by "The Awefull Battle of the Pekes and the Pollicles", with Gus remembering that he had played the part of the Great Rumpus Cat instead of Growltiger. The original London production's version of Mungojerrie and Rumpleteazer is slower (in 12/8 time) and has a more jazzy sound, while the more common, newer version is faster and more upbeat (4/4 time, with the middle verse in 7/8 time). In the original London production, Mungojerrie and Rumpleteazer were characters in their own right and sang their own song; this was later changed in the Broadway production, where Mr. Mistoffelees sang Mungojerrie and Rumpelteazer in the third person, with Mungojerrie and Rumpelteazer as puppets being magically controlled by Mr. Mistoffelees. Eventually, the Broadway version of the song was rewritten to allow Mungojerrie and Rumpleteazer to once again sing their own song as full characters. In the current licensed version, based on the recent UK tour, the 7/8 section is reworked into 4/4 with triplet quavers that simulate the original 12/8 version. The 2015 London revival and UK tour introduced numerous 'modernizations' to the show, such as a rapped version of "The Rum Tum Tugger," whose character and costume is also completely reworked, changing him from a ladies-man "rock star" style character, to a "young urban" style cat, changing him also from one of the adult toms, to one of the kittens. The 2015 Australian tour and 2015 Paris productions also used the new Tugger; however, the 2016 Broadway revival does not. The 2016 Broadway revival featured new choreography by Andy Blankenbuehler, who introduced more hip hop and cool jazz elements to the movements and dances. ^ Handy, Bruce (6 March 1994). "Endpaper; Kitty Litter". The New York Times Magazine. Archived from the original on 26 May 2015. Retrieved 27 March 2019. ^ "Best bets". China Daily. 24 March 2018. Retrieved 6 April 2019. ^ "Cats: Inspiration". Really Useful Group. Archived from the original on 24 July 2008. Retrieved 9 April 2019. ^ a b Riefe, Jordan (28 February 2019). "'Cats': Theater Review". The Hollywood Reporter. Retrieved 12 April 2019. ^ a b c d e Rich, Frank (8 October 1982). "Theatre: Lloyd Webber's 'Cats'". The New York Times. Archived from the original on 27 March 2019. Retrieved 27 March 2019. ^ Nunn, Emily (9 September 2005). "Calling all 'Cats' people". Chicago Tribune. Archived from the original on 27 March 2019. Retrieved 27 March 2019. ^ "The Story". Official website. Archived from the original on 17 April 2019. Retrieved 17 April 2019. ^ Smallwood, Christine (3 August 2016). "Memories of 'Cats'". The New Yorker. Retrieved 17 April 2019. ^ a b Hummler, Richard (13 October 1982). "Cats". Variety. Archived from the original on 2 April 2019. Retrieved 2 April 2019. ^ Trueman, Matt (12 December 2014). "West End Review: 'Cats,' With a Pussycat Doll and Rapping". Variety. Archived from the original on 5 April 2019. Retrieved 5 April 2019. ^ Quinn, Nicola (25 August 2016). "Cats / Our Review". New York City Theater. Retrieved 15 April 2019. ^ Kent, Melissa (28 February 2010). "Cat in the act". The Sydney Morning Herald. Retrieved 12 April 2019. ^ a b c d e f Nassour, Ellis (17 June 1997). "Cats Trivia Encyclopedia". Playbill. Archived from the original on 24 March 2019. Retrieved 24 March 2019. ^ a b c Huddleston Jr., Tom (4 August 2016). "'Cats' Is Returning to Broadway Minus One Racist Song". Fortune. Archived from the original on 4 April 2019. Retrieved 3 April 2019. ^ a b "Inside the Playbill: Cats – Opening Night at the Neil Simon Theatre: Scenes/Musical Numbers". Playbill. p. 4. Archived from the original on 24 March 2019. Retrieved 24 March 2019. ^ "Orchestra / Instrumentation List: Cats". The Musical Company. Archived from the original on 11 April 2019. Retrieved 11 April 2019. ^ a b c "Stage Cast Recordings: Cats (London)". British Phonographic Industry. Retrieved 25 March 2019. ^ a b c Bronson, Fred (19 October 1996). "Andrew Lloyd Webber: 25 Years of Broadway – The Musicals on Record". Billboard. 108 (42): ALW-16, 18. ISSN 0006-2510. ^ "Original London Cast: Cats [Original London Cast Recording]". AllMusic. Archived from the original on 24 March 2019. Retrieved 19 October 2013. ^ a b Culwell-Block, Logan. "The Definitive List of the 42 Best-Selling Cast Recordings of All Time". Playbill. Archived from the original on 24 March 2019. Retrieved 25 March 2019. ^ a b c "Cats (Original Cast)". Recording Industry Association of America. Archived from the original on 24 March 2019. Retrieved 25 March 2019. ^ "Original Broadway Cast Recording: Chart History: Billboard 200". Billboard. Archived from the original on 25 March 2019. Retrieved 25 March 2019. ^ a b Sampson, Jim (16 March 1985). "Special Report: West Germany, Austria, Switzerland ...Newsline..." Billboard. 97 (11): 9. ISSN 0006-2510. ^ "Cats sound recording: the original Australian cast". Trove. Archived from the original on 25 March 2019. Retrieved 25 March 2019. ^ a b c "劇団四季 CD: Cats (キャッツ)" [Gekidan Shiki CD: Cats] (in Japanese). Shiki Theatre Company. Archived from the original on 25 March 2019. Retrieved 25 March 2019. ^ "劇団四季ミュージカル CATS オリジナル・キャスト" [Gekidan Shiki Musical CATS Original Cast] (in Japanese). Amazon. Archived from the original on 26 March 2019. Retrieved 26 March 2019. ^ "German Cast Recording: Cats German Cast Live". AllMusic. Archived from the original on 25 March 2019. Retrieved 25 March 2019. ^ "劇団四季ミュージカル CATS ロングラン・キャスト" [Gekidan Shiki Musical CATS Long Run Cast] (in Japanese). Amazon. Archived from the original on 26 March 2019. Retrieved 26 March 2019. ^ "Koty – Various" [Cats – Various] (in Polish). Universal Music Polska. Retrieved 18 April 2019. ^ "劇団四季ミュージカル『キャッツ』＜メモリアルエディション＞ 全曲試聴映像公開! 豪華BOX商品写真公開!" [Shiki Theatre Company Musical 'Cats' (Memorial Edition) All songs preview video released! Luxurious BOX product photo release!] (in Japanese). Universal Music Japan. 26 March 2019. Archived from the original on 26 March 2019. Retrieved 26 March 2019. ^ a b "Gus/Growltiger". Official website. Archived from the original on 25 March 2019. Retrieved 20 March 2019. ^ a b "Demeter and Bombalurina". Official website. Archived from the original on 25 March 2019. Retrieved 20 March 2019. ^ "Bustopher Jones". Official website. Archived from the original on 30 March 2019. Retrieved 30 March 2019. ^ "Grizabella". Official website. Archived from the original on 25 March 2019. Retrieved 20 March 2019. ^ Milner, Catherine (20 January 2002). "Now Lloyd Webber puts Eliot's dogs to music". The Daily Telegraph. Retrieved 20 April 2019. ^ D'Alessandro, Anthony (26 September 2018). "'Cats': Dancer Mette Towley Joins Cast Of Universal-Working Title Film". Deadline. Archived from the original on 25 March 2019. Retrieved 20 March 2019. ^ "Jennyanydots". Official website. Archived from the original on 25 March 2019. Retrieved 20 March 2019. ^ "Macavity". Official website. Archived from the original on 25 March 2019. Retrieved 20 March 2019. ^ Sutherland, John (25 May 2016). "An introduction to Old Possum's Book of Practical Cats". British Library. Archived from the original on 25 March 2019. Retrieved 20 March 2019. ^ "Mister Mistoffelees". Official website. Archived from the original on 25 March 2019. Retrieved 20 March 2019. ^ Willmott, Phil (28 August 2015). "Who's your favourite Cats Cat?". LondonBoxOffice.co.uk. Retrieved 4 April 2019. ^ a b "Mungojerrie and Rumpelteazer". Official website. Archived from the original on 25 March 2019. Retrieved 20 March 2019. ^ "Munkustrap". Official website. Archived from the original on 25 March 2019. Retrieved 20 March 2019. ^ "Old Deuteronomy". Official website. Archived from the original on 25 March 2019. Retrieved 20 March 2019. ^ "Rum Tum Tugger". Official website. Archived from the original on 19 March 2019. Retrieved 20 March 2019. ^ "Skimbleshanks". Official website. Archived from the original on 19 March 2019. Retrieved 20 March 2019. ^ "Victoria". Official website. Archived from the original on 19 March 2019. Retrieved 20 March 2019. ^ a b Kay, Lauren Phoenix (30 November 2016). "What's a Jellicle Cat? Backstage at the Broadway Revival". Dance Magazine. Archived from the original on 29 March 2019. Retrieved 29 March 2019. ^ "A Brief History of the Poems". source: Cats playbill. Archived from the original on 11 May 2008. Retrieved 23 August 2008. ^ "Original London Cast List". Really Useful Group. Archived from the original on 15 August 2008. Retrieved 23 August 2008. ^ a b c d e f g h i j k l "Cats, Winter Garden Theatre 1634 Broadway (At W. 50th St.) – Cast". Playbill. Retrieved 20 April 2019. ^ "1998 Video Cast List". Really Useful Group. Archived from the original on 7 April 2010. Retrieved 1 May 2010. ^ a b Shenton, Mark (24 October 2014). "Complete Casting Announced for Cats at London Palladium". Playbill. Archived from the original on 26 March 2019. Retrieved 26 March 2019. ^ Shenton, Mark (28 September 2015). "Full Casting Announced for the Return of Cats to London Palladium". Playbill. Archived from the original on 19 April 2019. Retrieved 20 April 2019. ^ "Cats, Neil Simon Theatre 250 W. 52nd St., New York, NY – Cast". Playbill. Archived from the original on 14 April 2019. Retrieved 14 April 2019. ^ "Preview and Cast of Cats". PBS. Archived from the original on 28 March 2019. Retrieved 28 March 2019. ^ a b c d e f g h i j k l m Stewart, John (2006). "128. Cats". Broadway Musicals, 1943–2004. McFarland & Company. ISBN 978-0786495658. ^ Howell, Peter (14 December 2012). "Richard Armitage, The Hobbit's very tall dwarf". Toronto Star. Retrieved 11 April 2019. ^ "Cast lists: London, 2002". Really Useful Group. Archived from the original on 30 March 2010. Retrieved 26 March 2019. ^ "Anita Harris interview: Cinderella, Grand Opera House, York, from December 12 to January 4". The Press. 4 December 2014. Retrieved 20 April 2019. ^ a b Beaumont-Thomas, Ben (5 January 2015). "Cats curls up for longer stay in West End – with Kerry Ellis joining cast". The Guardian. Archived from the original on 26 March 2019. Retrieved 26 March 2019. ^ "Cast lists: New London, 2000–2001". Really Useful Group. Archived from the original on 12 December 2009. Retrieved 26 March 2019. ^ Gans, Andrew (26 December 1997). "Diva Talk: Divas From Europe & Cabaret News". Playbill. Archived from the original on 25 March 2019. Retrieved 26 March 2019. ^ Leach, Rebecca (23 August 2006). "Louie Spence – The Fantastic Face of Dance". Female First. Archived from the original on 25 March 2019. Retrieved 26 March 2019. ^ "Truly scrumptious". Linlithgow Gazette. 8 July 2005. Retrieved 20 April 2019. ^ Savage, Wayne (28 June 2013). "Ipswich: Co-op Juniors are off to the Jellicle Ball at New Wolsey". Ipswich Star. Retrieved 20 April 2019. ^ a b c d Simonson, Robert (21 July 2016). "Did You Know These 9 Actors Got Their Start in Cats?". Playbill. Archived from the original on 25 March 2019. Retrieved 26 March 2019. ^ a b c d e f Milzoff, Rebecca (29 July 2016). "7 Former Cats Cast Members on Learning to Play Feline". Vulture.com. Archived from the original on 25 March 2019. Retrieved 26 March 2019. ^ "Laurie Beechman". Internet Broadway Database. Retrieved 20 April 2019. ^ "An Introduction to Cats". Official website. Archived from the original on 16 April 2019. Retrieved 16 April 2019. ^ Alexander, Bryan (15 April 2019). "Judi Dench turns 'Cats' catastrophe into triumph playing Old Deuteronomy in movie version". USA Today. Retrieved 20 April 2019. ^ "Harry Rabinowitz, composer and conductor, dies at 100". BBC News. 23 June 2016. Retrieved 16 April 2019. ^ a b "Cats leaps back into the West End this December!". londonboxoffice.co.uk. 30 June 2014. Retrieved 4 July 2014. ^ "Cats To Make West End Return". London Theatre Direct. 30 June 2014. Archived from the original on 26 March 2019. Retrieved 26 March 2019. ^ Shenton, Mark (5 January 2015). "Cats Extends at London Palladium; New Grizabella Named". Playbill. Archived from the original on 26 March 2019. Retrieved 24 April 2015. ^ "CATS Confirmed for Palladium Return This Autumn". broadwayworld.com. 24 April 2015. Retrieved 24 April 2015. ^ "Beverley Knight Will Take on the Role of Grizabella in Andrew Lloyd Webber's Cats Revival". Broadway.com. 2 June 2015. Archived from the original on 26 March 2019. Retrieved 14 May 2016. ^ Walsh, Michael (October 2007). "The Curiosity of Cats". Smithsonian. Archived from the original on 27 March 2019. Retrieved 27 March 2019. ^ Ochs, Ed (29 January 1983). "Geffen Sizzles While Biz Drizzles: Broadway is Next Stage for Pop's Top Composers". Billboard. 95 (4): B-4. ISSN 0006-2510. ^ "PUBLIC LIVES; A Cat Now and for 17 Years (Nearly Forever)!". The New York Times. 25 February 2000. Retrieved 30 October 2018. ^ Culwell-Block, Logan (6 April 2018). "The Top 10 Highest-Grossing Broadway Shows of All Time". Playbill. Retrieved 20 March 2019. ^ Viagas, Robert (21 January 2016). "Now, Forever...and Again! Cats Revival Sets Broadway Dates". Playbill. Retrieved 12 April 2019. ^ "Exclusive: School of Rock's Mamie Parris to Succeed Leona Lewis as Grizabella in Cats on Broadway". Broadway.com. 22 September 2016. Retrieved 28 November 2016. ^ "Cats, Neil Simon Theatre 250 W. 52nd St., New York, NY". Playbill. Retrieved 14 April 2019. ^ "Cats Tour: First National". Internet Broadway Database. Archived from the original on 25 March 2019. Retrieved 25 March 2019. ^ "Cats Tour: Second National". Internet Broadway Database. Archived from the original on 25 March 2019. Retrieved 25 March 2019. ^ Sullivan, Dan (14 January 1985). "Stage Review: 'Cats' Approaches Purrfection". Los Angeles Times. Archived from the original on 25 March 2019. Retrieved 25 March 2019. ^ a b Ahearn, Victoria (9 June 2013). "'Cats' gets another life in Toronto, 28 years after original production". CTV News. Archived from the original on 25 March 2019. Retrieved 25 March 2019. ^ "Cats Tour: Third National". Internet Broadway Database. Archived from the original on 25 March 2019. Retrieved 25 March 2019. ^ "Cats Tour: Fourth National". Internet Broadway Database. Archived from the original on 25 March 2019. Retrieved 25 March 2019. ^ Rogers, Rick (29 April 2007). "The cat's meow: Oklahoma native Beau Speer helps show's cast members get in touch with their feline side". The Oklahoman. Archived from the original on 26 March 2019. Retrieved 26 March 2019. ^ a b Hetrick, Adam (13 December 2011). "Nine Lives and Three Decades Later, Cats National Tour Purrs Its Way Across U.S. With New Dates". Playbill. Retrieved 15 April 2019. ^ "Cast lists: US Tour, 2001". Really Useful Group. Archived from the original on 13 April 2010. Retrieved 26 March 2019. ^ "US Tour, 2003–2004". Really Useful Group. Archived from the original on 2 October 2009. Retrieved 9 April 2019. Jones, Chris (19 April 2002). "No union meow over 'Cats'". Chicago Tribune. Retrieved 15 April 2019. Lauer-Williams, Kathy (24 October 2009). "Flying High ** Wilson native is Broadway's newest Wicked Witch of the West ** 'Wicked' on Broadway". The Morning Call. Retrieved 20 April 2019. Flatow, Sheryl (12 July 2010). "The Art of Being Grizabella". Playbill. Archived from the original on 27 March 2019. Retrieved 27 March 2019. ^ Franklin, Marc J. (25 January 2019). "Production Photos: A Look at the National Tour of Cats". Playbill. Archived from the original on 25 March 2019. Retrieved 25 March 2019. ^ Curtis, John (9 April 2019). "Current and Upcoming National Tours". Playbill. Archived from the original on 14 April 2019. Retrieved 14 April 2019. ^ Gans, Andrew (19 July 2010). "Muny's Cats, with Block, Page, Teeter, Dunn, Dudding, Begins July 19". Playbill. Retrieved 15 April 2019. ^ "JANE MCDONALD HEADS CAST IN BLACKPOOL". Official website. 14 April 2015. Retrieved 9 April 2019. ^ Culley, Jon (15 February 1994). "Where Are They Now? : Robin Cousins". The Independent. Retrieved 9 April 2019. ^ "McLean-Williams: Robin Cousins" (PDF). McLean-Williams. Retrieved 9 April 2019. ^ "A purr-fect role... but I'm turning into a cat!". Lancashire Telegraph. 29 July 2003. Archived from the original on 8 April 2019. Retrieved 9 April 2019. ^ "Cast lists: UK tour, 2004–2005". Really Useful Group. Archived from the original on 27 May 2011. Retrieved 26 March 2019. ^ "Cast lists: UK Tour, 2006". Really Useful Group. Archived from the original on 5 February 2010. Retrieved 26 March 2019. ^ Flood, Tony (4 May 2007). "Cool Cat Chrissie had me purring". Croydon Guardian. Newsquest. Archived from the original on 8 April 2019. Retrieved 9 April 2019. ^ Wolfisz, Francine (18 April 2008). "Giving glamour to Grizabella". Bucks Free Press. Archived from the original on 8 April 2019. Retrieved 9 April 2019. ^ "The Memory Lives On – A New 'Cats' Tour in 2013". Official website. Archived from the original on 14 January 2013. Retrieved 3 March 2013. ^ "Cast Lists: UK/Europe tour, 2013". Official website. Archived from the original on 25 May 2013. Retrieved 9 April 2019. ^ a b "UK/Europe Tour (2014 Tour)". Official website. Archived from the original on 25 August 2014. Retrieved 11 April 2019. ^ Wells, Georgina (30 January 2016). "Cats: Andrew Lloyd-Webber, Opera House, Manchester, 30 January to 13 February 2016". The British Theatre Guide. Archived from the original on 25 March 2019. Retrieved 25 March 2019. ^ "Tour of Cats". Musical Theatre News. Archived from the original on 26 March 2019. Retrieved 26 March 2019. ^ "REFLECTIONS ON 'CATS' – Stagecoach Theatre Arts". Stagecoach.co.uk. Archived from the original on 7 February 2013. Retrieved 3 March 2013. ^ "Cats". Madách Színház. Retrieved 17 April 2019. ^ "Macskák 30 éve" [Cats 30 years]. Cultura Magazin (in Hungarian). 25 March 2013. Retrieved 17 April 2019. ^ "A MACSKÁK CÍMŰ MUSICAL ELŐADÁSÁN ELSZABADULT EGY KUTYA" [A Dog Was Released During the Presentation of the Cats Musical]. Színház.org (in Hungarian). 7 December 2017. ^ a b c "'Cats' in Wien" ['Cats' in Vienna]. Wiener Zeitung (in German). 24 September 2018. Retrieved 16 April 2019. ^ "Ute Lemper to Bring Songs from the Broken Heart to Feinstein's/54 Below This Weekend". BroadwayWorld. 6 January 2017. Retrieved 16 April 2019. ^ Jones, Kenneth (23 July 2001). "Steve Barton, Phantom's Original Raoul, Dead at 47". Playbill. Retrieved 16 April 2019. ^ a b "Curriculum Vitae". piadouwes.com. Retrieved 17 April 2019. ^ "Cats – A Legend Returns". Vereinigte Bühnen Wien. Retrieved 17 April 2019. ^ Arns, Lisa (29 January 2001). "'Cats': Abschied ohne Katzenjammer". Spiegel Online (in German). ^ "Stuttgart, March 2001". Really Useful Group. Archived from the original on 23 December 2009. Retrieved 9 April 2019. ^ Meza, Ed (1 July 2002). "Germany's Stage expands its holdings". Variety. Retrieved 18 April 2019. ^ "Cats: 2002 Berlin". Stage Entertainment. Retrieved 18 April 2019. ^ "Cats: 2004 Düsseldorf". Stage Entertainment. Retrieved 18 April 2019. ^ "Cats (Tour 2004–06)". Musicalzentrale (in German). Retrieved 18 April 2019. ^ a b c "Cats: Buy Tickets (2005)". Really Useful Group. Archived from the original on 7 April 2005. Retrieved 15 April 2019. ^ "CATS is back!" (in German). TKS Ticketservice. Archived from the original on 28 August 2010. ^ "Cats (Tour 2011–13)". Musicalzentrale (in German). Retrieved 18 April 2019. ^ "Cats". Sceneweb (in Norwegian). Retrieved 17 April 2019. ^ "Teppefall". Dagbladet (in Norwegian). 16 January 2002. Retrieved 17 April 2019. ^ Baden, Torkil Olav (17 September 2009). "Tamme katter" [Tame cats] (in Norwegian). NRK. Retrieved 19 April 2019. ^ "Cats: Helsinki Production (1986)". Ovrtur. Retrieved 17 April 2019. ^ Malmstedt, Kalle (13 January 2006). "Cats nästa på Göteborgsoperan" [Cats next at the Gothenburg Opera]. Göteborgs-Posten (in Swahili). Retrieved 17 April 2019. ^ "Cats". Gothenburg opera house. Retrieved 17 April 2019. ^ "English Version of West End Musical Cats Still Popular". Amsterdam RAI Exhibition and Convention Centre. 20 June 2018. Archived from the original on 25 March 2019. Retrieved 25 March 2019. ^ van Gelder, Henk (17 September 1991). "Carré verbouwt en brengt ondertussen weer musical Cats". NRC Handelsblad (in Dutch). Retrieved 18 April 2019. ^ a b c "Cats: Buy Tickets (2006)". Really Useful Group. Archived from the original on 17 October 2006. Retrieved 15 April 2019. ^ a b "New UK Tour of CATS to Cross the Channel and Play Belgium in 2013". BroadwayWorld. 25 September 2012. Retrieved 18 April 2019. ^ "Cats: 2006 Rotterdam". Stage Entertainment. Retrieved 18 April 2019. ^ "Cast" (in Dutch). Stage Entertainment. Archived from the original on 1 October 2006. Retrieved 18 April 2019. ^ "Cats: 2003 Madrid". Stage Entertainment. Retrieved 18 April 2019. ^ "Cats: 2005 Moscow". Stage Entertainment. Retrieved 18 April 2019. ^ Kishkovsky, Sophia (19 March 2005). "Can 'Cats' win over Russians?". The New York Times. Archived from the original on 8 April 2019. Retrieved 9 April 2019. ^ "Cats: 2015 Paris". Stage Entertainment. Retrieved 18 April 2019. ^ "The Cast of Cats Paris is Announced". Official website. 15 September 2015. Archived from the original on 26 March 2019. Retrieved 26 March 2019. ^ a b Falcone, Daniel (8 October 2017). "CATS cumple 35 años desde su estreno" [CATS celebrates 35 years since its premiere]. Musicales Baires (in Spanish). Retrieved 20 April 2019. ^ "Performance: Cats; Paris (France) : Théâtre de Paris – 23-02-1989". Bibliothèque nationale de France. Retrieved 18 April 2019. ^ Wagner, Reinmar. "'Cats' in Basel". Musik und Theater. Retrieved 18 April 2019. ^ van den Hanenberg, Patrick (5 June 1996). "Cats moet Vlaamse musical wakker schudden" [Cats must wake up the Flemish musical]. de Volkskrant (in Dutch). Retrieved 18 April 2019. ^ "'Cats' løbet i gang". Politiken (in Danish). 1 August 2002. Retrieved 18 April 2019. ^ "Koty – Opis" [Cats – Description] (in Polish). Teatr Roma. Retrieved 18 April 2019. ^ "Cats: Buy Tickets (2008)". Really Useful Group. Archived from the original on 8 February 2008. Retrieved 20 April 2019. ^ "CATS To Speak Italian, Set For Compagnia della Rancia 2009/2010 Season". BroadwayWorld. 31 March 2009. Retrieved 18 April 2019. "'Cats' Mais Tempo em Lisboa" [More 'Cats' in Lisbon]. Correio da Manhã (in Portuguese). 11 July 2004. Retrieved 18 April 2019. "Cats the musical returns to Portugal". Portugal Resident. 23 August 2006. Retrieved 18 April 2019. ^ "Cats (Tour 2008–09)". Musicalzentrale (in German). Retrieved 18 April 2019. ^ "2013 UK/Europe Tour". Official website. Archived from the original on 22 May 2013. Retrieved 11 April 2019. ^ "2014 UK/Europe Tour". Official website. Archived from the original on 20 February 2014. Retrieved 9 April 2019. "Tour Dates (2016)". Official website. Archived from the original on 12 April 2016. Retrieved on 15 April 2019. "Tour Dates (2017)". Official website. Archived from the original on 24 March 2017. Retrieved on 15 April 2019. "Tour Dates (2018–19)". Official website. Archived from the original on 14 December 2018. Retrieved on 15 April 2019. ^ "Muzikálová diva Katarína Hasprová: Pravda o rivalstve so Sklovskou!" [Musical Diva Katarína Hasprová: The Truth About Rivalry with Sklovská!]. Nový čas (in Slovak). 28 March 2016. Archived from the original on 25 March 2019. Retrieved 25 March 2019. ^ Ting, Lisabel (13 August 2014). "Keep Kallang Theatre". AsiaOne. Retrieved 19 April 2019. ^ "캣츠 Cats (1994/02/24 ~ 1994/03/13)" (in Korean). 플레이 DB. Retrieved 19 April 2019. ^ a b "SA Cats going to Malaysia". News24. 27 March 2002. Retrieved 20 April 2019. "캣츠 Cats (2003/01/29 ~ 2003/03/02)" (in Korean). 플레이 DB. Retrieved 19 April 2019. "캣츠 CATS (2003/12/02 ~ 2004/01/04)" (in Korean). 플레이 DB. Retrieved 19 April 2019. ^ "Shanghai, 2003". Official website. Archived from the original on 16 January 2013. Retrieved 9 April 2019. ^ "CATS Taipei details". Really Useful Group. Archived from the original on 3 June 2004. Retrieved 19 April 2019. ^ a b "Cast lists: Beijing, 2004". Really Useful Group. Archived from the original on 13 April 2010. Retrieved 26 March 2019. ^ "Cats: Buy Tickets (2004)". Really Useful Group. Archived from the original on 3 June 2004. Retrieved 15 April 2019. ^ "Cats: Buy Tickets (2007)". Really Useful Group. Archived from the original on 11 October 2007. Retrieved 15 April 2019. "캣츠 – 대구 CATS (2007/05/31 ~ 2007/07/01)" (in Korean). 플레이 DB. Retrieved 19 April 2019. "캣츠 CATS (2007/07/06 ~ 2007/09/02)" (in Korean). 플레이 DB. Retrieved 19 April 2019. "캣츠 Cats (2008/05/30 ~ 2008/08/31)" (in Korean). 플레이 DB. Retrieved 19 April 2019. "캣츠 – 대구 Cats (2008/09/05 ~ 2008/09/21)" (in Korean). 플레이 DB. Retrieved 19 April 2019. "캣츠 – 부산 Cats (2008/09/27 ~ 2008/10/26)" (in Korean). 플레이 DB. Retrieved 19 April 2019. "캣츠 CATS (2009/02/06 ~ 2009/02/15)" (in Korean). 플레이 DB. Retrieved 19 April 2019. "캣츠 – 수원 CATS (2009/03/07 ~ 2009/03/15)" (in Korean). 플레이 DB. Retrieved 19 April 2019. "캣츠 – 광주 CATS (2009/04/21 ~ 2009/04/26)" (in Korean). 플레이 DB. Retrieved 19 April 2019. ^ "Musical 'Cats' moves to Xi'an". China Internet Information Center. 9 April 2008. Retrieved 16 April 2019. ^ a b "Cast lists: Asia Pacific/Australian tour, 2009–2010". Really Useful Group. Archived from the original on 30 March 2010. Retrieved 26 March 2019. ^ "Tickets: Cats (2009)". Really Useful Group. Archived from the original on 19 April 2019. Retrieved 20 April 2010. ^ "Cats". HK Ticketing. Archived from the original on 9 March 2009. Retrieved 19 April 2019. ^ Oliveros, Oliver (24 July 2010). "Lea Salonga Plays 'Grizabella' the Philippines, 7/24". BroadwayWorld (Philippines). Archived from the original on 25 March 2019. Retrieved 25 March 2019. ^ "Guangzhou: Mandarin Cats". China Daily. 30 November 2012. Retrieved 9 April 2019. ^ Singh, Bryna (14 January 2015). "Musical review: Not enough meat in the high-energy, visually spectacular Cats". The Straits Times. Retrieved 14 April 2019. "캣츠 CATS (2017/07/09 ~ 2017/09/10)" (in Korean). 플레이 DB. Retrieved 19 April 2019. "캣츠 – 울산 CATS (2017/10/13 ~ 2017/10/15)" (in Korean). 플레이 DB. Retrieved 19 April 2019. "캣츠 – 인천 CATS (2017/10/20 ~ 2017/10/22)" (in Korean). 플레이 DB. Retrieved 19 April 2019. "캣츠 – 성남 (2017/11/24 ~ 2017/11/26)" (in Korean). 플레이 DB. Retrieved 19 April 2019. "캣츠 CATS (2018/01/27 ~ 2018/02/18)" (in Korean). 플레이 DB. Retrieved 19 April 2019. ^ Zhang Ke (6 December 2017). "Hit musical 'Cats' to tour 13 Chinese cities in 2018". CGTN. Retrieved 16 April 2019. ^ a b "International Tour: Tickets (2019)". Official website. Archived from the original on 15 April 2019. Retrieved 15 April 2019. ^ Cox, Karly (13 September 2017). "Andrew Lloyd Webber's musical 'Cats', one of the longest running shows on London's West End, coming to Hong Kong in 2018". South China Morning Post. Retrieved 19 April 2019. ^ "Classic musicals 'Cats' and 'Evita' to tour Taiwan". Taipei Times. 9 March 2018. Retrieved 19 April 2019. ^ "캣츠 CATS (2008/09/19 ~ 2009/01/18)" (in Korean). 플레이 DB. Retrieved 19 April 2019. ^ "빅뱅 대성 '귀여움 즐길 "캣츠" 무대 선보일터'" [Big Bang's Daesung "Delights in 'Cats'"]. Newsen (in Korean). 17 September 2008. Archived from the original on 19 February 2012. Retrieved 19 April 2019. "캣츠 – 이천 CATS (2011/08/26 ~ 2011/08/28)" (in Korean). 플레이 DB. Retrieved 19 April 2019. "캣츠 – 전주 CATS (2011/09/02 ~ 2011/09/04)" (in Korean). 플레이 DB. Retrieved 19 April 2019. "캣츠 Musical Cats (2011/09/17 ~ 2011/12/31)" (in Korean). 플레이 DB. Retrieved 19 April 2019. "캣츠 – 부산 Musical CATS (2012/01/13 ~ 2012/01/29)" (in Korean). 플레이 DB. Retrieved 19 April 2019. "캣츠 – 광주 Musical CATS (2012/02/03 ~ 2012/02/05)" (in Korean). 플레이 DB. Retrieved 19 April 2019. "캣츠 – 창원 Musical CATS (2012/02/10 ~ 2012/02/12)" (in Korean). 플레이 DB. Retrieved 19 April 2019. "캣츠 – 대전 Musical CATS (2012/02/17 ~ 2012/02/19)" (in Korean). 플레이 DB. Retrieved 19 April 2019. "캣츠 – 인천 Musical CATS (2012/02/24 ~ 2012/02/26)" (in Korean). 플레이 DB. Retrieved 19 April 2019. "캣츠 – 진주 Musical CATS (2012/03/09 ~ 2012/03/11)" (in Korean). 플레이 DB. Retrieved 19 April 2019. "캣츠 – 청주 Musical CATS (2012/03/17 ~ 2012/03/18)" (in Korean). 플레이 DB. Retrieved 19 April 2019. "캣츠 – 군포 Musical CATS (2012/03/23 ~ 2012/03/25)" (in Korean). 플레이 DB. Retrieved 19 April 2019. "캣츠 – 대구 Musical CATS Musical CATS (2012/04/06 ~ 2012/04/08)" (in Korean). 플레이 DB. Retrieved 19 April 2019. "캣츠 – 제주 Musical CATS (2012/04/20 ~ 2012/04/22)" (in Korean). 플레이 DB. Retrieved 19 April 2019. 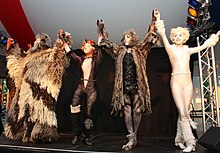 ^ a b "'キャッツ・ワールド'をつくりあげる、キャッツ・シアター" ['Cats Theatre' to create Cats World] (in Japanese). Shiki Theatre Company. Archived from the original on 7 April 2019. Retrieved 7 April 2019. ^ "Keita Asari, founder of Shiki Theater, dies in Tokyo at age 85". Asahi Shimbun. 19 July 2018. Archived from the original on 25 March 2019. Retrieved 25 March 2019. ^ a b "Cats: Introduction". Shiki Theatre Company. Archived from the original on 6 April 2019. Retrieved 6 April 2019. ^ "【動画追加】『キャッツ』が日本公演通算1万回を達成しました！" [(Video added) 'Cats' has achieved 10,000 concerts in Japan!] (in Japanese). Shiki Theatre Company. 13 March 2019. Archived from the original on 6 April 2019. Retrieved 6 April 2019. ^ "Cats, Theatre Royal, Sydney, NSW, 26 July 1985". AusStage. Archived from the original on 25 March 2019. Retrieved 25 March 2019. ^ "Pawing through our memories of Cats in Australia". Radio National. 28 May 2018. Archived from the original on 25 March 2019. Retrieved 25 March 2019. ^ "Cats, Her Majesty's Theatre, Melbourne, VIC, 10 October 1987". AusStage. Retrieved 14 April 2019. ^ "Cats, Festival Theatre, Adelaide, SA, 24 February 1989". AusStage. Retrieved 14 April 2019. "Cats, Princess Theatre (1886- ), Melbourne, VIC, 28 August 1993, 6 November 1993". AusStage. Retrieved 14 April 2019. "Cats, Lyric Theatre, South Brisbane, QLD, 28 July 1994, 3 September 1994". AusStage. Retrieved 14 April 2019. "Cats, Newcastle Civic Theatre, Newcastle, NSW, 10 September 1994, 1 October 1994". AusStage. Retrieved 14 April 2019. "Cats, Her Majesty's Theatre (1973-2001), Sydney, NSW, 31 December 1994". AusStage. Retrieved 14 April 2019. "Cats, Festival Theatre, Adelaide, SA, 30 December 1995, 27 January 1996". AusStage. Retrieved 14 April 2019. ^ a b Edwards, Matt (17 January 2016). "CATS news: Delia Hannah confirmed to play Grizabella in Adelaide & Perth". AussieTheatre. Archived from the original on 25 March 2019. Retrieved 25 March 2019. ^ "Cast lists: Australian Tent tour, February 2001". Really Useful Group. Archived from the original on 25 September 2009. Retrieved 26 March 2019. "Cats Run Away to the Circus, Australia, Australia, 11 December 1999, 24 February 2001". AusStage. Retrieved 14 April 2019. "Cats Run Away to the Circus, Samuel Sherlock Reserve, Frankston, VIC, 3 January 2001". AusStage. Retrieved 14 April 2019. "Cats Run Away to the Circus, Amphitheatre, Gateway Island, Wodonga, VIC, 10 January 2001". AusStage. Retrieved 14 April 2019. "Cats Run Away to the Circus, Bolton Park, Wagga Wagga, NSW, 17 January 2001". AusStage. Retrieved 14 April 2019. "Cats Run Away to the Circus, Aerodrome Ovals, Mildura, VIC, 24 January 2001". AusStage. Retrieved 14 April 2019. "Cats Run Away to the Circus, Weroona Oval, Bendigo, VIC, 31 January 2001". AusStage. Retrieved 14 April 2019. "Cats Run Away to the Circus, North Gardens, Ballarat, VIC, 7 February 2001". AusStage. Retrieved 14 April 2019. "Cats Run Away to the Circus, Vansittart Park, Mt Gambier, SA, 14 February 2001". AusStage. Retrieved 14 April 2019. "Cats Run Away to the Circus, Harris Street Reserve, Warrnambool, VIC, 21 February 2001". AusStage. Retrieved 14 April 2019. ^ "Cats". Harvest Rain Theatre Company - Musical Theatre, Brisbane, Theatre. Retrieved 7 June 2015. ^ Dionysius, Bobbi-Lea (5 July 2014). "CATS – Harvest Rain Breaks Records". AussieTheatre. Archived from the original on 25 March 2019. Retrieved 25 March 2019. ^ "Cast Announced for the All-Australian Production of Andrew Lloyd Webber's Cats". Official website. 8 July 2015. Archived from the original on 26 March 2019. Retrieved 26 March 2019. ^ Whitton, Rebecca (3 November 2015). "Cats – The Musical". Australian Stage Online. Archived from the original on 26 March 2019. Retrieved 26 March 2019. ^ "Delta Goodrem Plays 'Grizabella' in Australian Production of CATS, Beginning Tonight in Sydney". BroadwayWorld. 30 October 2015. Archived from the original on 25 March 2019. Retrieved 25 March 2019. ^ "Delia Hannah to Play Grizabella in Adelaide & Pertha". Official website. Retrieved 25 March 2019. ^ "Auckland, 1989–1990". Official website. Archived from the original on 27 June 2013. Retrieved 9 April 2019. ^ "SOPHIA RAGAVELAS TO STAR IN THE NEW PRODUCTION OF ANDREW LLOYD WEBBER'S CATS NEW ZEALAND". Official website. 8 July 2015. Archived from the original on 9 April 2019. Retrieved 9 April 2019. ^ "Las siete vidas de CATS" [The seven lives of CATS]. Proceso (in Spanish). 7 August 2005. Retrieved 20 April 2019. ^ Cruz, Itai (18 July 2016). "CATS regresa a Broadway, tras 16 años de haber cerrado el telón" [CATS returns to Broadway, 16 years after closing the curtain]. Cartelera de Teatro CDMX (in Spanish). Retrieved 20 April 2019. ^ a b Godoy, Mauro (19 February 2019). "Manuel Landeta ¡vuelve a maullar!" [Manuel Landeta returns to meow!]. Pásala! (in Spanish). Retrieved 25 March 2019 – via PressReader. ^ a b "Yuri dará vida a Grizabella en el musical Cats" [Yuri will play Grizabella in the musical Cats]. El Sol De Mexico (in Spanish). 22 August 2018. Archived from the original on 25 March 2019. Retrieved 25 March 2019. ^ "Landeta asegura que elenco de Cats supera al de 1991" [Landeta ensures that cast of Cats exceeds 1991]. Vanguardia MX (in Spanish). 6 May 2013. Archived from the original on 25 March 2019. Retrieved 25 March 2019. ^ "Musical 'Cats' que viene a Santiago cuenta con un artista chileno en su elenco" [Musical 'Cats' that comes to Santiago has a Chilean artist in its cast] (in Spanish). Radio Cooperativa. 19 September 2006. Retrieved 20 April 2019. ^ Achurra, Tomás (15 March 2014). "Musical 'Cats' llega por primera vez a Chile con elenco nacional" [Musical 'Cats' arrives for the first time in Chile with a national cast]. 24 Horas (in Spanish). Retrieved 20 April 2019. ^ "'Cats' llega a Colombia" ['Cats' arrives in Colombia]. El Espectador (in Spanish). 1 September 2009. Retrieved 20 April 2019. ^ Pelogia, Gustavo (25 March 2010). ""Pensei muito se eu realmente daria conta", diz Paula Lima sobre 'Cats'" ["I thought a lot if I really would," says Paula Lima about 'Cats'] (in Portuguese). Terra (Brazil). Archived from the original on 25 March 2019. Retrieved 25 March 2019. ^ "Cats all set to purr in Doha". Travel and Tourism News Worldwide. November 2003. Retrieved 20 April 2019. ^ "Hit musical show Cats comes to Qatar". Gulf Times. 30 January 2017. Retrieved 20 April 2019. ^ "Cats musical meets Istanbul audience". Hürriyet Daily News. 26 December 2013. Retrieved 18 April 2019. ^ Steinberg, Jessica (12 October 2014). "'Cats' comes to Israel". The Times of Israel. Retrieved 18 April 2019. ^ "Cats Coming to Oasis of the Seas". Cruise Industry News. 4 April 2014. Retrieved 4 April 2014. ^ Hughes, William (8 July 2014). "Explore the dark, moody art of Steven Spielberg's animated Cats". The A.V. Club. Retrieved 21 March 2019. ^ "The Film". Official website. Retrieved 21 March 2019. ^ "Original Cast Recording: Cats". British Phonographic Industry. Retrieved 25 March 2019. ^ "Les Misérables director Tom Hooper to bring Cats to the big screen". Entertainment Weekly. 5 May 2016. Retrieved 6 May 2016. ^ Schaefer, Sandy (13 December 2018). "Cats Movie Musical Officially Begins Filming; Full Cast Revealed". Screen Rant. Retrieved 21 March 2019. ^ "Evening Standard Theatre Awards 1980–2003". Evening Standard. 29 October 2003. Archived from the original on 24 March 2019. Retrieved 25 March 2019. ^ "Olivier Winners 1981". Society of London Theatre. Archived from the original on 24 March 2019. Retrieved 25 March 2019. ^ "25th Annual Grammy Awards Final Nominations". Billboard. 95 (3): 67. 22 January 1983. ISSN 0006-2510. ^ "Awards: 1983". Drama Desk. Archived from the original on 24 March 2019. Retrieved 25 March 2019. ^ "Awards for 1982–1983". Outer Critics Circle Award. Archived from the original on 24 March 2019. Retrieved 25 March 2019. ^ "Winners: 26th Annual GRAMMY Awards (1983)". The Recording Academy. Archived from the original on 24 March 2019. Retrieved 25 March 2019. ^ "HHA Nominees & Recipients – Year: 1985, Show Title: Cats". theatreWashington. Archived from the original on 26 March 2019. Retrieved 26 March 2019. ^ "The 15th Annual Carbonell Awards". Carbonell Awards. Archived from the original on 26 March 2019. Retrieved 26 March 2019. ^ "The 18th Annual Carbonell Awards". Carbonell Awards. Archived from the original on 26 March 2019. Retrieved 26 March 2019. ^ "Archives: Cats (2003)". Jeff Award. Archived from the original on 26 March 2019. Retrieved 26 March 2019. ^ "HHA Nominees & Recipients – Year: 2005, Show Title: Cats". theatreWashington. Archived from the original on 26 March 2019. Retrieved 26 March 2019. ^ "Archives: Cats (2014)". Jeff Award. Archived from the original on 26 March 2019. Retrieved 26 March 2019. ^ "Past nominees and winners – Year: 2010 – Genre: Musicals". Live Performance Australia. Archived from the original on 25 March 2019. Retrieved 25 March 2019. ^ "Past Recipients: 2010". Green Room Awards. Archived from the original on 3 December 2014. Retrieved 25 March 2019. ^ "Historique des Nominations aux Molieres 1987 – 2018" [History of the Molieres Nominations 1987 – 2018] (PDF) (in French). Les Molières. Archived (PDF) from the original on 25 March 2019. Retrieved 25 March 2019. ^ "Palmares de 1987 à 2018" [Winners from 1987 to 2018] (PDF) (in French). Les Molières. Archived (PDF) from the original on 25 March 2019. Retrieved 25 March 2019. ^ Fierberg, Ruthie (12 September 2017). "Tommy Tune, Andy Blankenbuehler, The Great Comet Cast, and More Win Big at the First-Ever Chita Rivera Awards". Playbill. Archived from the original on 28 March 2019. Retrieved 29 March 2019. ^ "Cats UK Tour". Cats UK Tour. Archived from the original on 3 May 2008. Retrieved 23 April 2008. ^ "Cats: classic musical to feature a rapping cat". Telegraph.co.uk. Retrieved 19 March 2016. ^ "Rum Tum Tugger to return as a rapping feline in 'Cats' revival". PBS NewsHour. Retrieved 19 March 2016. ^ Fierberg, Ruthie (12 June 2016). "What to Expect from Andy Blankenbuehler's Re-Imagining of Cats". Playbill. Retrieved 15 April 2019. Wikimedia Commons has media related to Cats (musical).